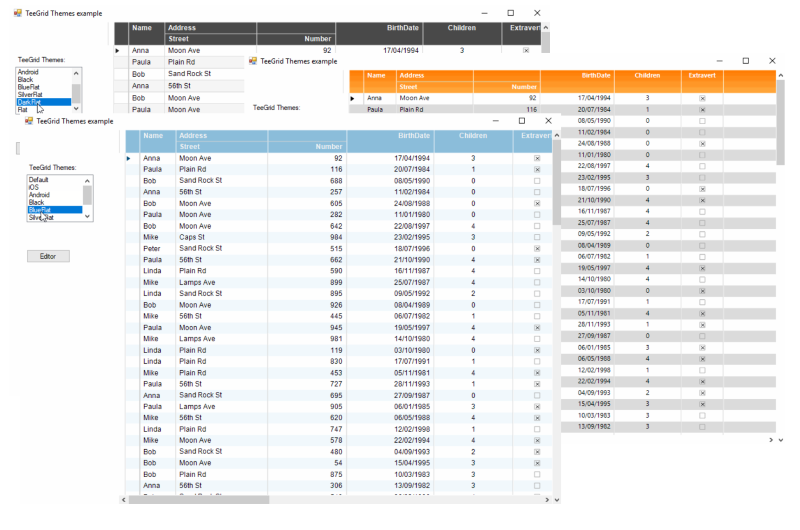 The feature-packed NET data grid provides features such as sorting, grouping or filtering grid data, resizable columns, master-detail view, draggable selections, grid scrolling. These built-in features can be enabled just using a few property settings. TeeGrid can be linked to any sort of database, like a TDataset, TDataSource, arrays of objects or records, pure \'Virtual Mode\' or any other source.The Grid control offers master-detail data presentation. Any selected row in the master grid can be expanded to display its detail rows. Detail rows can be displayed in hierarchical data grid.TeeGrid offers many features to manage the rows and columns sizing, formatting and more to your grid tables;Locked columns allows to lock/fix a specified number of rows and columns. Any grid column can be locked to a grid edge (left or right).Column dragging allows you to move or re-order grid columns using drag-and-drop. Select the column you want to move and drag the column\'s header to a different position in the grid.Column resizing feature allows you to modify the column width in a grid.Grid scrolling functionality lets you perform horizontal / vertical scrolling to display data using grid scrollbars or arrow keys, mouse-dragging or finger-touch.TeeGrid is fully compatible with Visual Studio NET offering you the means to take common core code for gridding on Windows, Android and iOS/macOS. TeeGrid ships with some default themes to optionally custom match to each environment. Unique utility to develop SSIS package programmatically with more ease and effectiveness. Available code snippets for Creation Name for each component in SSIS package.